Countertops should hold only things you use on a daily basis. Create a permanent spot for everything else, including appliances. "Clutter-free countertops make you feel like you have things under control," says Meryl Starr, author of The Home Organizing Workbook. 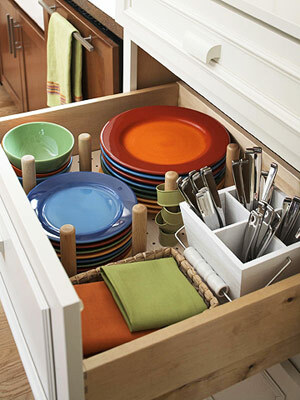 Avoid jumbled messes in drawers and cupboards with dividers, bags, and caddies for frequently used items, such as silverware, napkins, even baking supplies. 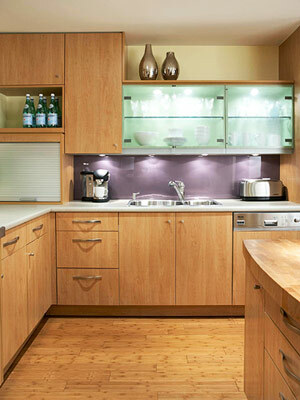 Most cabinet manufactures have good options for pullouts, shelf inserts, hooks, and other kitchen organizing tools. To prevent the room from becoming a dumping ground, try this rule: By dinnertime, the kitchen must be clear of personal items. To get a handle on all the food, gadgets, and equipment that live in the kitchen, catalog those you use regularly and divide them based on where in the room they're most used. Store things as close as possible to where you use them. If you rarely or never use an item, give it away or store it in an out-of-the-way spot, such as in the basement, on high shelves in the pantry, or in the back of a corner cabinet.